The key is that my husband and I each play the game so we double up on the benefits. By the way, we use this strategy for our credit card hobby to collect points and miles as well. For example, we each used our own loyalty chips to stay for “free” at Vdara on the Strip. The chips covered the $87 per night room fee however we still had to pay the $36 per night resort fee and $20 per 24 hr parking fee. When we check into the hotels using the rewards, the staff is always accommodating to join our individual reservations so we don’t have to change rooms or check-out and check back in. Our room at the Vdara was fantastic! Actually, it’s my favorite room of all the hotels we’ve stayed in so far. I loved staying at the Bellagio (not using MyVegas chips) in a room overlooking the fountain except for the nights the Paris disco was rattling our windows. The Vdara rooms are incredibly silent and private. You don’t hear anyone walking down the halls or in adjoining rooms. 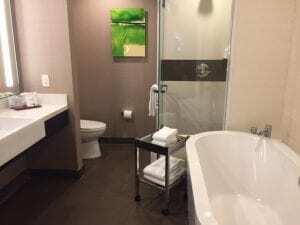 The bathroom is one of the nicest of anywhere we have stayed–I loved the tub! The biggest negative, and it was a big one, is the pool and hot tub were closed for renovations. We were able to use the Aria’s facilities but it’s a schlep over there so we didn’t use them. Another negative is the parking situation at Vdara is valet only for $30 per day, plus tips every time you need to use your car. We’re cheap so we used the Aria lot for $20 per day since we were in and out a few times. 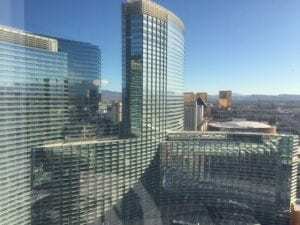 The Vdara is on the Strip but tucked back behind The Cosmopolitan so it’s a little farther to walk to the Strip but there is a convenient free shuttle between the Aria/Mirage, The Shops at Crystal/The Cosmopolitan and the Bellagio. We used MyVegas rewards for a glass of wine and a nice cocktail at Harvest in the Bellagio before we went to dinner. Both drinks were $18 each so that was a nice savings and I tried a cocktail I would never have tried without it being free. It was really good (and strong!) and worth $18 but it was even better free. We aren’t big fans of brunch or buffets but we always use MyVegas rewards to go to one on our last day in town before our drive back to Los Angeles. The Mirage buffet was really good–the best we have had the chance to try. The reward is actually for breakfast or lunch valid from 7 a.m.-3 p.m. so we go for brunch just before they start to change out the breakfast items for lunch and that way we can have a little of both meals and we are set until dinner at home. Weekday breakfast is $17 and lunch is $22. MyVegas Rewards are the reason we keep going back to Las Vegas at least once a year. We never gamble but we add to the local economy in other ways like eating out and sightseeing. This trip we spent an afternoon hiking in Valley of Fire State Park about an hour from the Strip. It was amazing! We spent part of one evening at TopGolf, which was expensive but fun. In fact, TopGolf was about half of our entire expense of this trip but Bob’s a big golfer so he really wanted to try it and a friend of ours who lives in Las Vegas joined us and we got her local discount. Another really fun and cheap thing we did was Twilight Zone Monster Mini Golf at Bally’s for $11.95 per person. The music was great and it was very fun to play putt-putt with blacklights. 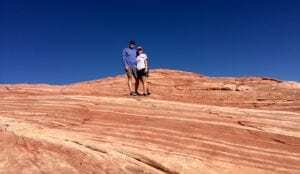 Valley of Fire State Park–Amazing! There is a lot to do in Las Vegas on and off the Strip. Many people say Las Vegas is expensive but MyVegas Rewards make it affordable compared to a lot of other major U.S. cities. As long as you limit your gambling and avoid shopping, you can have a lot of fun without spending a ton of money. Next Is Flying Business Class Worth the Miles Spent?